Random And Some: "You know, one good apple can spoil the rest"
BuzzFeed's Books That Will Actually Change Your Life listicle is the gift that keeps on giving. The list previously introduced me to Kazuo Ishiguro's beautiful Never Let Me Go and also contains Zen and the Art of Motorcycle Maintenance, The Fault in Our Stars (movie coming June 6! ), and World War Z. 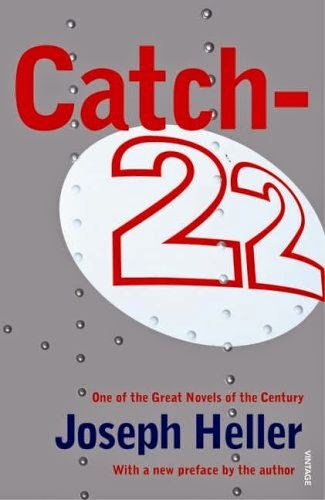 "Catch-22" immediately spoke to me because I find the concept fascinating. According to my old college friend Wikipedia, it basically stands for "a paradoxical situation from which an individual cannot escape because of contradictory rules". In others words: a damned if you do, damned if you don't situation. The 1961 novel, as you might expect, is chock full of catch-22 situations. John Yossarian is a captain in the U.S. Army during World War II. His Air Forces squadron is stationed in Pianosa, Italy, and is growing weary of Colonel Cathcart constantly raising the number of missions to complete service. As Yossarian keeps looking for ways to stay alive, Heller introduces a flurry of "minor characters", who still play a major part in the sense that their motives, coping mechanisms and idiosyncrasies directly and indirectly influence Yossarian and, in fact, all of their fellow airmen. With Catch-22, Heller tragically and hilariously demonstrates that armies and organizations are not machines, and that the inner-workings of such institutions are still made up of individuals with egos and ulterior motives. Except of course for the famous Canibus line ("You counselor advised you not to speak / My counselor advised me to keep rhyming 'til they stop the beat / In the words of Joseph Heller, I learned how to write better / Even though it sort of irked me / He said he didn't understand the process of imagination / But he felt he was at its mercy"), I knew nothing of Joseph Heller. I'm glad that he and I finally got acquainted. His writing is very rich, with great structure and many witty turns of phrases that will put a smile on your face. I must admit, though, that it took me 100-some pages to get calibrated with his style. Prepare to have a lot of different characters and plots thrust upon you! It might come across as messy and confuse you, but it was done deliberately by Heller and does indeed serve a purpose. Go read this!